Wondering what to gift her this year on her birthday? Well, I’ve got you sorted.. 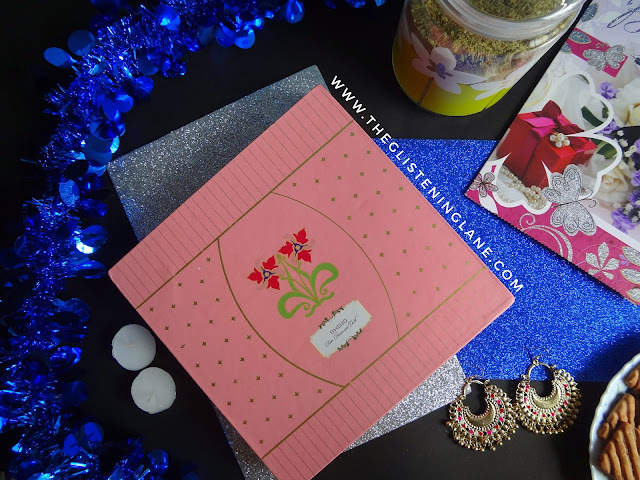 Roses, Chocolates & Jewelry are passé and enough years have been spent onto those. 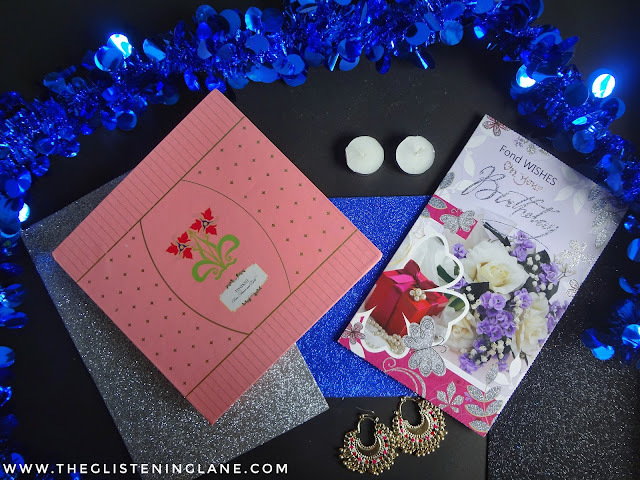 It’s time to think out of the box & possibly mean that you did enough preparations beforehand rather than getting a bouquet ready at the last minute. So without further adieu, let’s begin with today’s post! 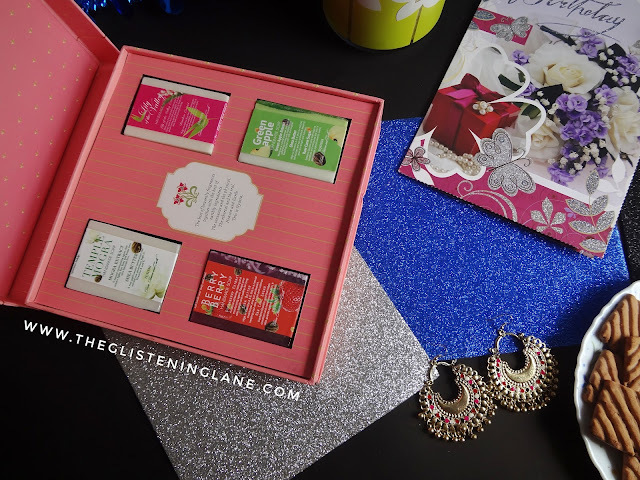 Best of Nyassa for Her: An elegant & luxurious gift box perfectly put together for her. These handmade soap bars are enriched with skin loving ingredients suited to delicate skin. 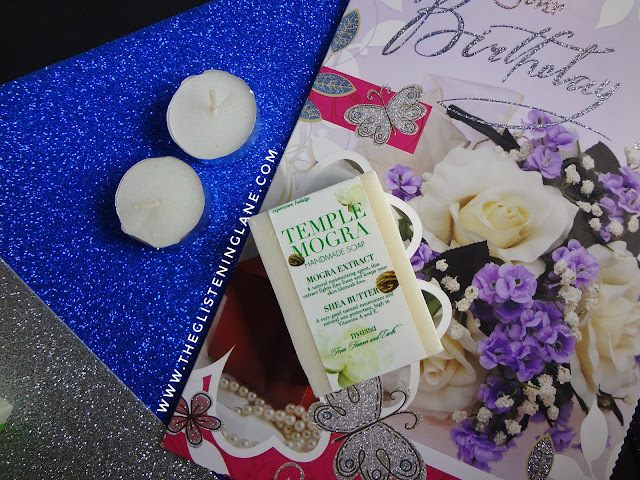 This hand-crafted luxury contains Nyassa’s most loved fragrances by women; Green Apple, Lily of the Valley, Temple Mogra and Berry Berry Soaps. 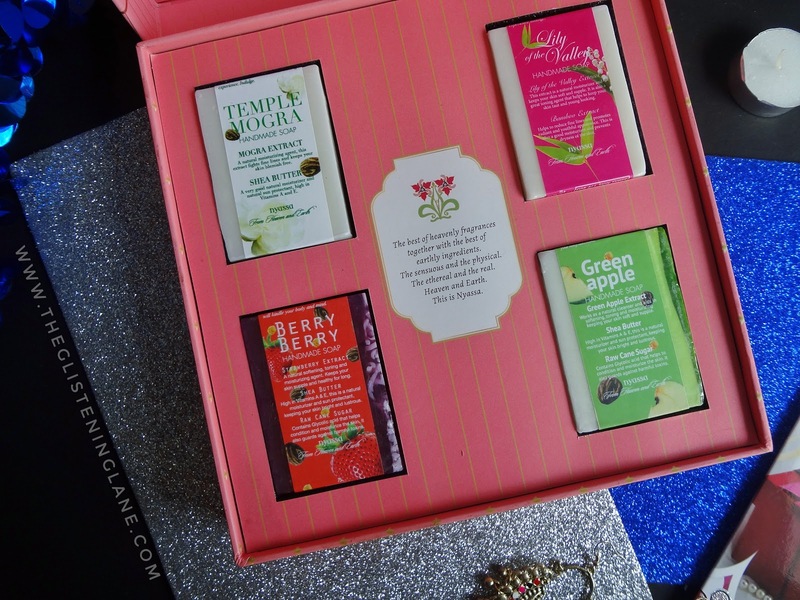 Buy Online: To place an order for pampering yourself or someone dear, click HERE. 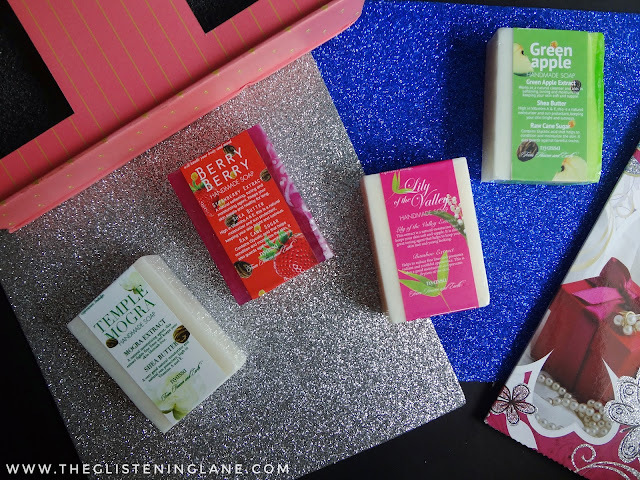 All these soaps are 75 grams each and the best part is, these are Handmade! Description: From Heaven & Earth – Redolent & expressive fragrances come together with beneficial natural ingredients in this handcrafted bath soap. Infused with Nyassa’s exclusive ActiveBase – a nutritious blend of six natural oils and extracts; each bath bar is a promise of a delightful and wholesome bathing experience. Indulge. 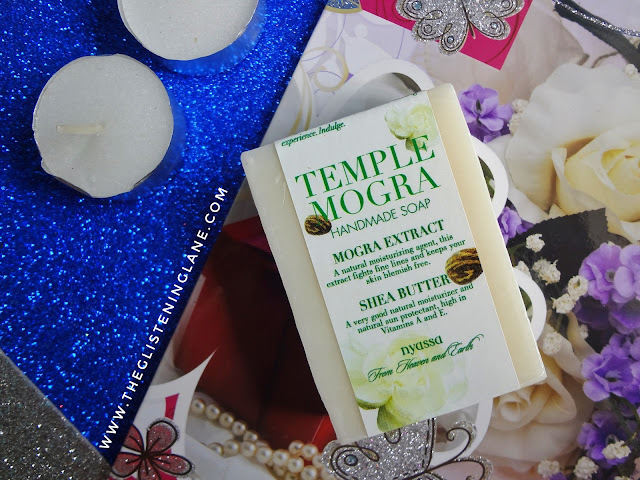 👉Mogra Extract – A natural moisturizing agent, this extract fights fine lines and keeps your skin blemish free. 👉Shea Butter – A very good natural moisturizer and natural sun protectant, rich in Vitamin A and E.
Ingredients: Mogra Extract, Shea Butter, Activate Base (Aloevera Extract, Grape Seed Extract, Honey, Cold Pressed Sweet Almond Oil, Cold Pressed Wheat Germ Oil, Vitamin E Acetate), Water, Sodium Stearate, Propylene Glycol, Sucrose, Sodium Laureth Sulphate, Glycerin, Sodium Chloride, Disodium EDTA, BHT, Fragrance and Titanium Dioxide. 👉Lily of the Valley Extract – This extract is a natural moisturizer and keeps your skin soft and supple. It is also a great toning agent that helps to keep your skin taut and young looking. 👉Bamboo Extract - Helps to reduce fine lines and promotes radiant and youthful appearance. This is also a good moisturizer and prevents dryness of the skin. Ingredients: Lily of the Valley Extract, ActiveBase (Aloe Vera Extract, Grape Seed Extract, Honey, Cold Pressed Sweet Almond Oil, Cold Pressed Wheat Germ Oil, Vitamin E Acetate), Water, Sodium Cocoate, Sodium Stearate, Propylene Glycol, Sucrose, Sodium Laureth Sulphate, Glycerine, Sodium Chloride, Disodium EDTA, BHT, Fragrance, Colour Cl NO. 19140, 17200 and Titanium Dioxide. 👉Green Apple Extract – Works as a natural cleanser and helps in softening, toning and moisturizing, keeping your skin soft and supple. 👉Shea Butter – Rich in Vitamins A & E, this is a natural moisturizer and sun protectant, keeping your skin bright and lustrous. 👉Raw Cane Sugar – Contains Glycolic acid that helps to condition and moisturize the skin. It also guards against harmful toxins. 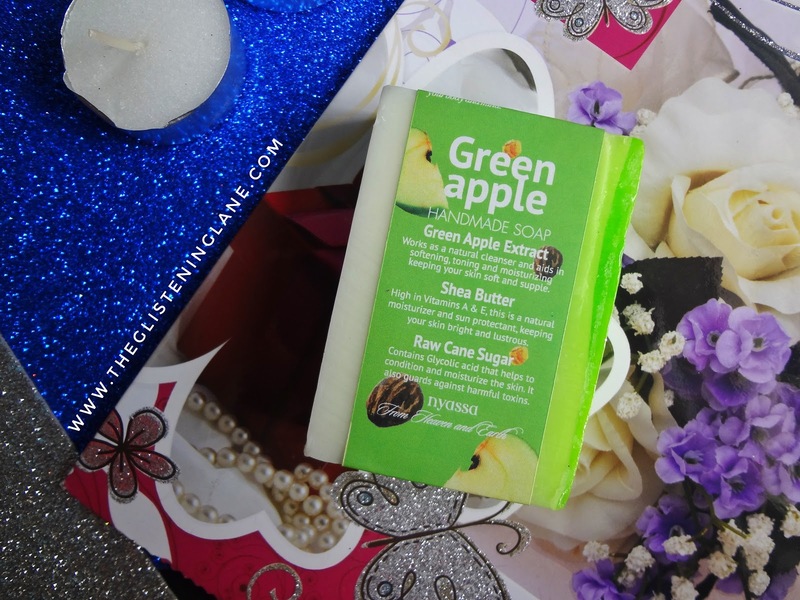 Ingredients: Green Apple Extract, shea butter, raw cane sugar, ActiveBase (Aloe Vera Extract, Grape Seed Extract, Honey, Cold Pressed Sweet Almond Oil, Cold Pressed Wheat Germ Oil, Vitamin E Acetate), Water, Sodium Cocoate, Sodium Stearate, Propylene Glycol, Sucrose, Sodium Laureth Sulphate, Glycerine, Sodium Chloride, Disodium EDTA, BHT, Fragrance, Colour Cl NO. 19140, 42045 and Titanium Dioxide. For me personally, bathing remains to be a relaxing time. It is also the duration wherein I wanna try every new product that got added within my vanity. 😅 Not to forget, I have the habit of reading the packaging under shower itself! 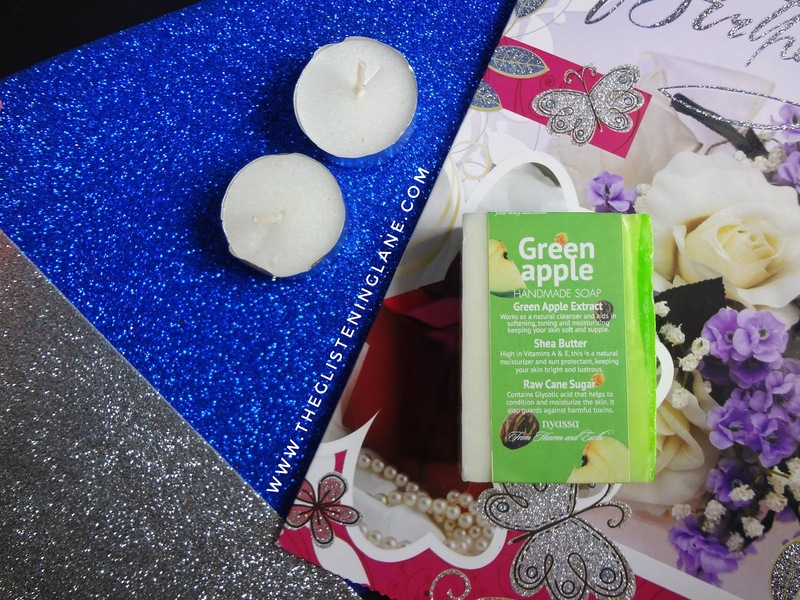 When it comes to body cleansing, I prefer hydrating soaps or body washes as my arms skin is really dry. Non-hydrating soaps actually make it worse in appearance by turning them into lands struck by drought. 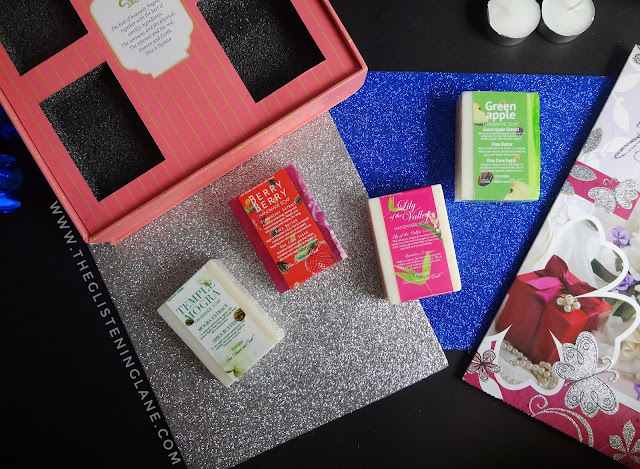 On first glance, I was super impressed by the packaging/box within which all these soaps came. The box is pale pink in colour & looks pretty fancy for gifting. And inside it, the soaps are neatly kept within hollows created as a case for each soap above the sponge cushion base. When I was still removing the courier package, I could sense it had beautiful fragrance & these aren’t mild at all. The fragrances captured within these soaps are quite unique; for instance the Berry Berry soap has sweet fragrance with sudden warmth to it. Whereas from a berry product you expect usual citrusy fragrance but that isn't the case here. In short, the elements of fragrance has been taken from ordinary space yet revamped it to turn it exquisite! Also, these fragrances don’t vanish under the shower. Now what I like most about these soaps is that they are handmade. When it comes to gifting, I prefer things handmade. Because of course with literally no time for all of us to create things, handmade gifts are really an appealing choice. Since these soaps have glycerine added within them, they do not give my hands a tough time; rather makes them soft to touch. The soap also leaves a lingering refreshing feel. 100% Vegetarian & Against Animal Testing! ❤Amazing packaging; best gifting option! 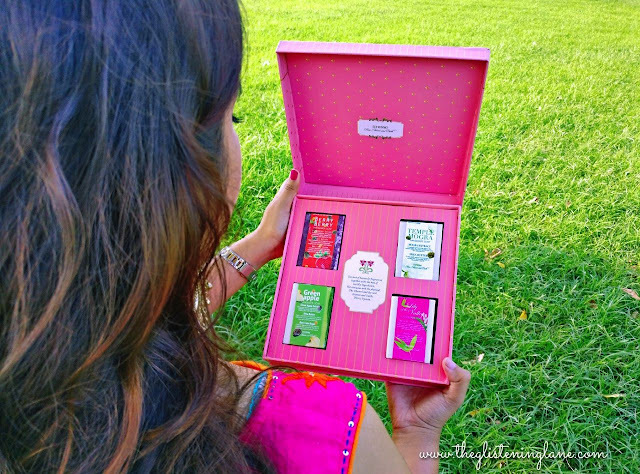 ❤Unique Fragrances have been packed within this gift set.